Municipal bond investment can be done through variety of investment funds. One of them is using Closed End Funds or CEFs. These muni bond closed end funds are traded like stocks. 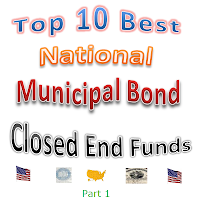 Some of the best national municipal bond closed end funds are: Eaton Vance Municipal Income, Invesco Van Kampen Municipal Opportunities Trust, Invesco Van Kampen Municipal Investment Grade Trust, etc. To invest in Municipal bond funds or muni bond funds, there are 3 ways such as Mutual Funds, Exchange Traded Funds (ETFs), and Closed End Funds (CEFs). In this article, I’ll discuss about investing in National Muni Bond CEFs (i.e. not single state bond fund). Bond fund can be divided into 2 categories such as taxable bond fund and non taxable bond fund. Government bond, corporate bond, high yield bond, limited duration bond, mortgage bond and senior loan bond are considered as taxable income bonds. Some of these CEFs can include short term bond, intermediate term bond, and long term bond CEFs. This taxable bond fund distribution or yield will be taxed in federal and state tax system. The other bond CEFs are non taxable bond CEFs. These non taxable bond CEFs are also known as municipal bond CEFs. The municipal bond has advantages especially for people that pay high income tax on Federal and State level since the dividend or yield is tax free or tax exempt from federal income tax and state income tax. These municipal bond funds mostly consist of bonds issued by variety of US States such as Pennsylvania, Texas, New York, California, Arizona, Michigan etc. I will focus especially on diversified national municipal bond CEFs. Please note, all fixed income bonds carry interest rate risk and credit risk. These funds may use leverage to provide higher yield or distribution. This yield may be paid either monthly or quarterly. I have used the following criteria to select this top 10. Firstly, the funds have high yield or high distribution. Secondly, the dividend will be paid monthly. Finally, the funds need to be liquid by having more than $100 million asset. The list was compiled from cefconnect, closed-endfunds, and cefa website. 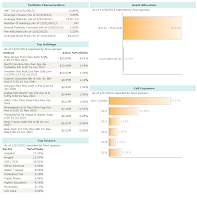 This EV Municipal Income fund is part of Eaton Vance Management closed end funds. The EV Municipal Income Fund objective is seeking free tax current income from Federal income tax through investment in investment grade municipal securities. The fund manager is Thomas M. Metzold since January 1999. It is rated as 2 stars fund in Morningstar rating. The total expense is 2.07% per year (including 1.73% baseline expense and 0.33% interest expense). The fund total net asset is 464 million with 51.3% effective leverage. As of March 2011, the top 5 municipal bond sectors of this closed end fund are Healthcare, Transportation, Housing, Education, and Industrial. The top 5 state municipals are New York, Florida, California, Texas, and Massachusetts. There are 191 bonds in its holding currently. It currently sells at premium from its NAV. The Invesco Van Kampen Municipal Opportunity Trust fund (Ticker: VMO) seeks to provide current income exempt from Federal income tax through investment in investment grade municipal bonds and inverse floating rate obligations. The fund managers are Wimmel since 2001, Byron since 2009, and Stryker since 2009. 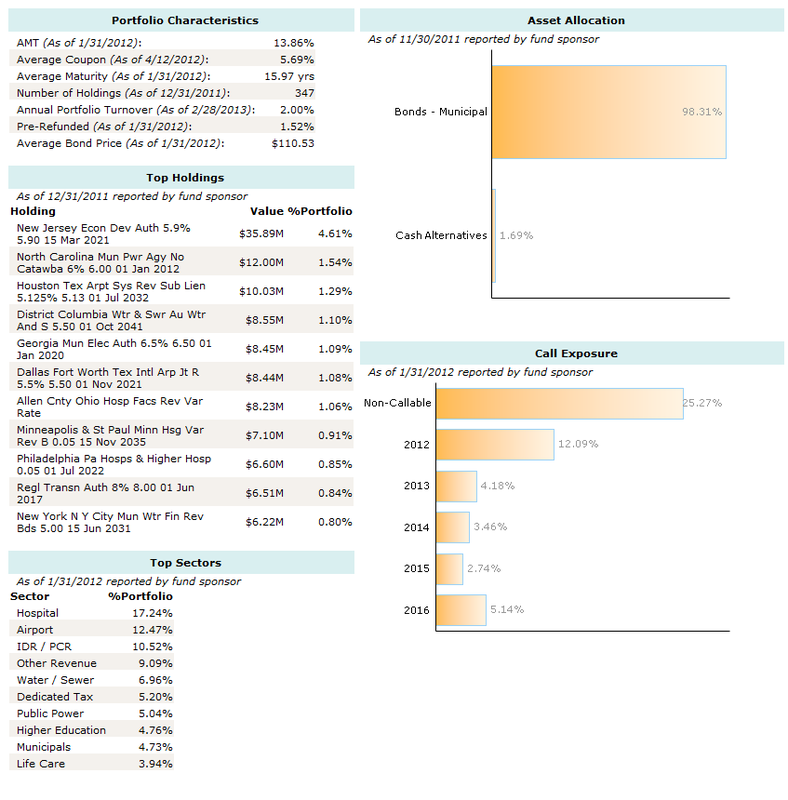 The fund expense ratio is 1.29% per year. 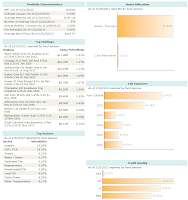 The distribution rate is 8.20% per year; this fund distributes the yield monthly. The fund total net assets are 744 million. The average credit rating is A which is investment grade municipal bond. As of February 2011, the top 5 sectors are Transportation, Health sector, Industrial, Utilities, and Education. The top 5 state municipals are Texas, California, Illinois, New Jersey, and Florida. There are 348 bonds in its holding currently. It currently sells at 1.04% premium from its NAV. Similar to VMO fund, this Invesco VK Muni Investment Grade Trust fund is part of Invesco Advisers CEFs. The Invesco Van Kampen Municipal Investment Grade Trust fund seeks high current income exempt from Federal income tax with capital preservation by investing in investment grade municipal debts or bonds. The fund managers are Byron since 1997, Wimmel since 2001, and Stryker since 2009. The total expense is 1.23% per year. The total net asset of this fund is 1.22 billion. As of February 2011, the top 5 sectors are healthcare sector, transportation, industrial, education, and advanced refunded. The top 5 state municipals are Florida, California, Texas, New York, and Illinois. There are 477 bonds in its holding currently. It currently sells at premium from its NAV. This Eaton Vance Municipal fund objective is to provide tax free income from federal income tax. The fund will invest primarily in investment grade bonds or debts. The fund is managed by William H Ahern since February 2010. This national municipal bond closed end fund has total net assets of 1.37 billion. 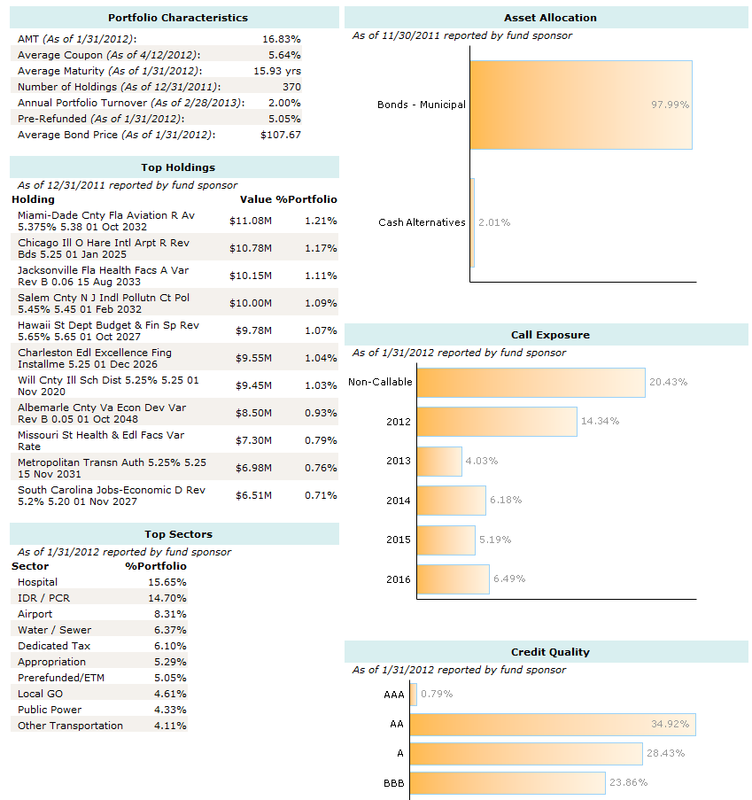 The fund annual expense ratio is 1.66% (1.12% baseline expense and 0.54% interest expense). As of February 2011, the top 5 sectors are transportation, general obligation, education, and healthcare sector. The top 5 state municipals are Texas, New York, Florida, California, and Illinois. There are 171 bonds in its holding currently. It currently sells at premium from its NAV. As part of Invesco Advisers fund, this Invesco Van Kampen Advantage Municipal Income II fund's objective is to seek high current income exempt from Federal income tax with capital preservation through investment in investment grade municipal securities. The fund managers are Thomas Byron, Robert Wimmel, and Robert Stryker since 2010. The top 3 sectors are hospital, IDR / PCR and airport. The top 5 states municipal are California, Illinois, Texas and Florida. There are 368 bonds in its holding currently. The total expense is 1.53% per year. It currently sells at premium from its NAV. 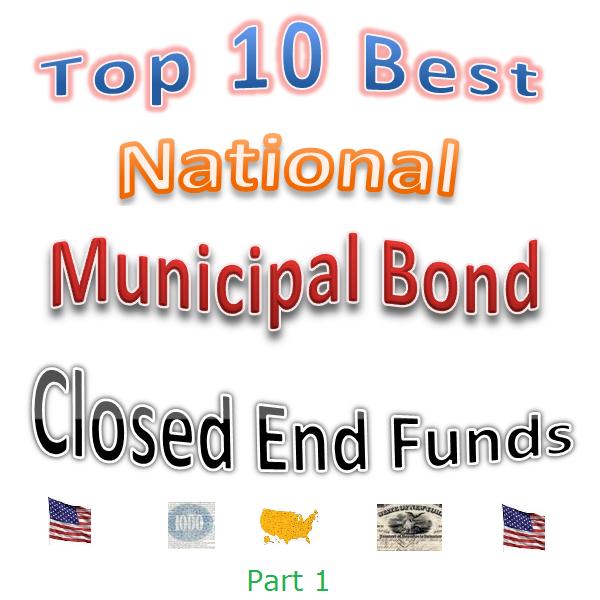 You will find more top national municipal closed end fund on my part 2 article.